BMC did an excellent work in the last 20 kilometers and Philippe Gilbert made sure he won’t let his teammates down, by finishing first and taking his 8th career win in a Grand Tour, and Belgium’s 155th in the Giro d’Italia. Once again, Fabio Aru didn’t feel good and Alberto Contador noticed that, so he accelerated on the final 500 meters, which helped him increase his lead in the general classification. Thanks to his impetuous action, Contador now has 17 seconds over Fabio Aru, who said after the stage that he couldn’t hold wheels because of hypoglycemia, reassuring everyone this situation won’t repeat in the following days. 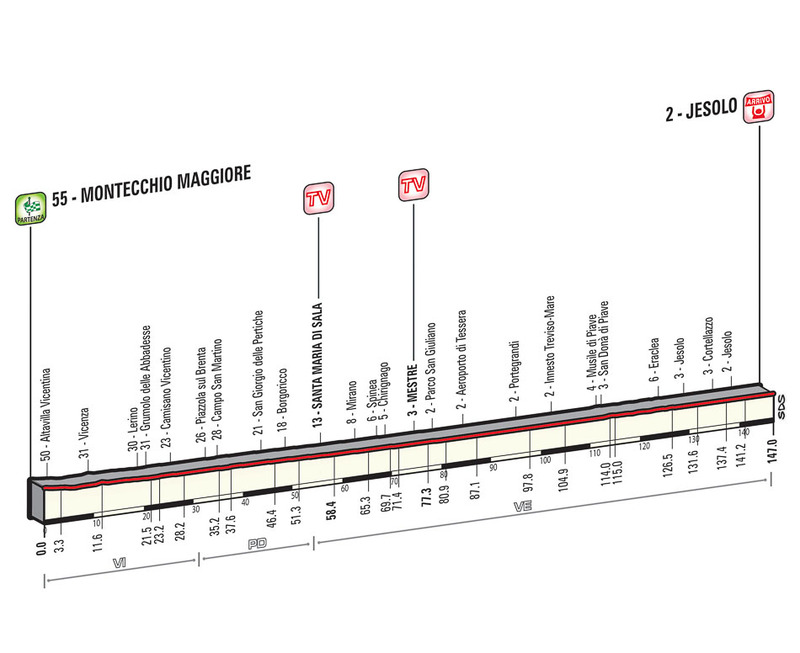 Stage 13, between Montecchio Maggiore and Lido di Jesolo (147 kilometers), is one of the shortest of the 2015 Giro d’Italia, and it is also entirely flat. The route runs across the Venetian Plain, from Montecchio Maggiore through Vicenza, Piazzola sul Brenta, Mirano, Mestre and Musile di Piave to Eraclea, where the final 20 kilometers begin. Watch out for a number of obstacles, such as roundabouts, speed bumps and traffic dividers, while crossing urban areas. The stage has a fast-running finale on level roads. After crossing the Piave River in Eraclea, the route first hits the city of Jesolo and then reaches Cortellazzo via the road that rolls along the riverbank. Here in Cortellazzo, the road turns right onto a bridge with narrowed roadway. The stage course then takes wide, flat and straight roads, “sprinkled” with roundabouts with different diameters, that lead to the finish line. The home straight is approximately 500-m long, on 7-m wide asphalt road. André Greipel is the favorite, considering he is the most powerful sprinter on such a finish, but also that he has Greg Henderson in the team, who can provide an excellent lead-out, just as he did in Castiglione della Pescaia. On the other hand, Sacha Modolo can be advantaged by the technical finale, which can help him overcome Greipel and get his first Grand Tour win. Giacomo Nizzolo has a strong train, but he needs to be well-positioned, which happens rarely with him in the last hectic meters of a stage. Other candidates for the victory are Luka Mezgec, Moreno Hofland and Elia Viviani, who will try to take back the red jersey, which is now sitting on Nicola Boem’s shoulders. Lido di Jesolo will host a Giro d’Italia finish for the fifth time. At the previous occasions, only home riders got the win: Rino Benedetti (1955), Dino Zandegu (1970), Paolo Cimini (1987) and Alessio Di Basco (1988).